On February 27th, 2016, an all day presentation and panel discussion on industrial hemp is scheduled at the Great Hall at Cooper Union, a venue made famous when Abraham Lincoln gave his impassioned speech against allowing the advancement of slavery to the Western Territories. Currently, we as a country face another form of slavery: that being a form of corporatism that continues to impact our ability to grow the American economy through the cultivation of industrial hemp. 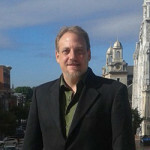 Executive Director of the Hemp Industries Association, Eric Steenstra, will give an over view of the history of industrial hemp in America up through and including the contemporary hemp movement and how we can get involved in ending the 70 year ban on growing hemp in our country regardless of whether we live in urban or rural areas. Panelists include Mike Lewis, founder of Growing Warriors in Kentucky and one of the leaders in the hemp farm movement; Tim Callahan, owner of Alembic Studio, designer and builder of hempcrete homes and Jamie Campbell Petty, the Founder of the Indiana Chapter of the HIA. Vermont farmer and activist Joel Bedard will address the issues and concerns faced by hemp farmers as the crop transitions to legal status. The day will close with the screening of “Bringing it Home,” a film by Linda Booker which chronicles the hemp movement in the United States and Canada. The work of artist Glenn Goldberg will be on view from March 3rd through the 6th at the Art on Paper New York fair being held at Pier 36. Approximately 20,000 attendees will have the opportunity to view this unique work and learn about industrial hemp. In collaboration with master paper maker Paul Wong at Dieu Donne Press, Goldberg will translate his iconic imagery from paint to hemp. The entire installation will be produced from industrial hemp, bringing the notion of paper and working on paper down to its most basic roots. Glenn Goldberg will include a series of drawings made with sheets of hemp paper he received as a gift from Morris Beegle of the Colorado Hemp Company made from the first legal harvest of hemp in America in more than 50 years. On March 5th, 2016, our second panel presentation on industrial hemp will cover hemp legislation in New York State; CBD oil production, the ability to buy CBD oil online and use; industrial hemp in Colorado and the opening of the hemp processing plant in Kentucky. Speakers include New York Assemblywoman Donna Lupardo; Trey Riddle of Sunstrand LLC; Colorado hemp farmer Ryan Loflin; Morris Beegle, owner of the Colorado Hemp Company and Joel Stanley, who with his brothers created the CBD oil strain Charlotte’s Web. Sponsors include Dr. Bronner’s Magic Soap, Manitoba Harvest, Nutiva, Vote Hemp, and other leading manufacturers in the hemp industry. HEMP NY CITY is being produced by Mia Feroleto, the creator of ARTWALK NY and other groundbreaking events in Manhattan. Associate Producer Susie Cody is the President of the New York HIA. For additional information please contact Mia Feroleto at mia.feroleto@gmail.com or by telephone at 802 952 6217 and visit their website at www.hempnycity.com. The time to enact legislation that will allow our farmers to cultivate industrial hemp is right now. There are two bills currently waiting floor votes in the Pa. General Assembly – Senate Bill 50 and House Bill 967. Both bills were introduced with bipartisan support into their respective Agricultural and Rural Affairs committees and in May the issue received a bicameral hearing. In October, both committees voted unanimously to send the bills to the floor for a vote. Both bills attempt to align Pennsylvania law with current federal law. 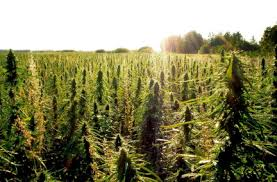 The federal farm bill passed in 2014 contains Section 7606 which allows farmers to grow hemp if affiliated with a university research program or licensed by their state departments of agriculture, provided they live in states that have passed pro-hemp legislation. 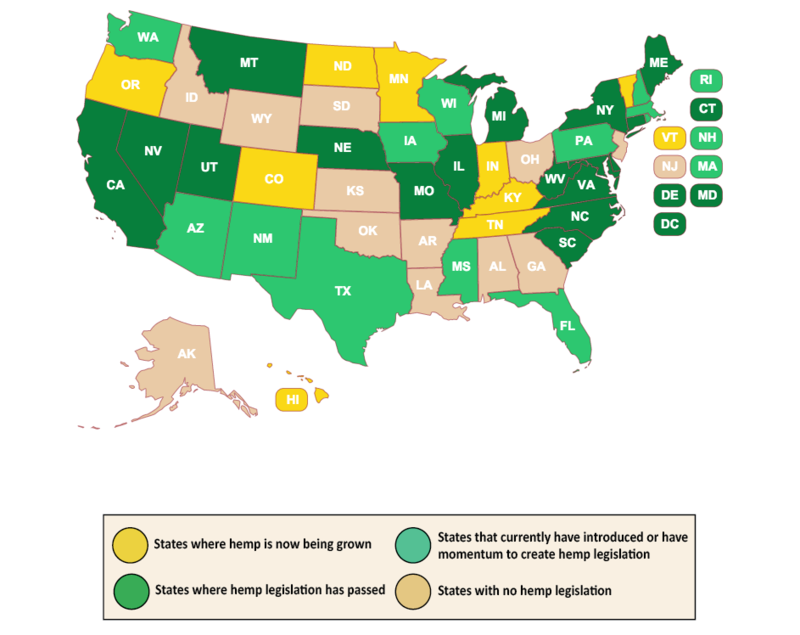 Currently, 27 states have passed laws that align with Section 7606 and allow their farmers to grow hemp. Kentucky cultivated 3,000 acres of hemp last year and is entering their third season for growing the crop. Colorado will be entering their fourth year of cultivating industrial hemp and will put in another several thousand acres. 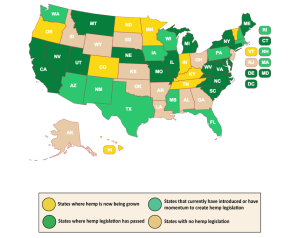 A half dozen states in all grew hemp last year and this year it is expected to be grown in a dozen states including New York. If we can pass hemp legislation right now, we may be able to get seeds in the ground this spring. A delay will force us to wait an entire year while our competitors take the lead. As a board member of the newly created Pennsylvania Hemp Industry Council, I talked to hundreds of people this year at the 100th Pa. Farm Show in Harrisburg. It was the organization’s debut event. 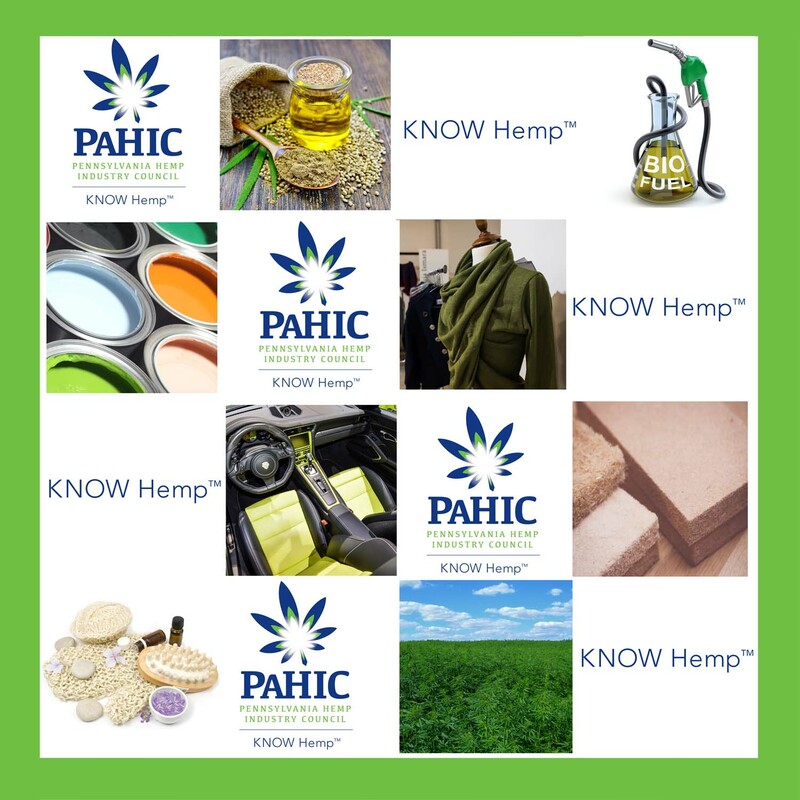 The mission of the PaHIC is to get the legislation over the finish line and then to match up interested farmers with industry that can make use of the seed, stalk, fiber and cellulose material of the hemp plant. Overall we talked to thousands of people and what we found out was that there is much excitement about industrial hemp in Pa. No surprise there, after all the Lancaster Farm Bureau passed pro-hemp resolutions all the way back in 1999 and 2000. Farmers all across the state are ready to go and we have industry ready to commit to buying crops of hemp right off the bat. We’ve been talking about hemp in Pennsylvania for a long time but never has there been this much excitement. We are so close now that we can feel it – the birth of a new billion dollar industry in the commonwealth. We have everything going for us in Pennsylvania – a rich history of hemp production, an innovative agricultural industry, some of the best soil on earth and close proximity to all major markets on the east coast. With those kind of advantages, Pennsylvania is positioned to not just participate, but to lead in the new emerging American hemp industry. All we are waiting on is for the industrial hemp bills to be scheduled for votes on the floor. If voted on, we are positive a hemp bill will pass and be signed into law. This will be a positive step for the entire state and will create jobs, protect the environment and help agriculture. That’s what’s called a win-win-win. Tell the General Assembly they should act now! In September of 1777, a delegation from the Continental Congress led by future president John Adams visited the hemp mill and oil mill where both hemp fiber and hempseed oil were processed in Bethlehem by the Moravians. Adams wrote about it in his diary. The year earlier, the Provisional Convention for the state of Pennsylvania had recommended the erection of a large number of hemp mills and urged every farmer in the state to grow as much hemp as they could. The Moravians had been milling hemp and hempseed oil in Bethlehem since at least 1752 but the times were getting serious. Hemp was popular all over Pennsylvania since it’s founding by William Penn in 1681 but now with the ongoing Revolutionary War the cultivation of hemp became of vital importance in order to establish self sufficiency and independence. Hemp was already one of the four staples of trade in Pennsylvania as early as Penn’s day but the period of 1765-1820 was the golden age of hemp in the state. The culture of hemp in that era was nearly universal and remained quite common for many decades hence. After the invention of the cotton gin the cultivation of hemp gradually declined in Pa. yet it still remained in the crop rotation all the way into the 1940’s. Over the years hundreds of hemp mills processed hemp in all parts of the state. Rope manufactures and other industries that made use of hemp employed tens of thousands of people. In 1794, President George Washington visited a hemp mill owned by David Witmer in Lancaster County. 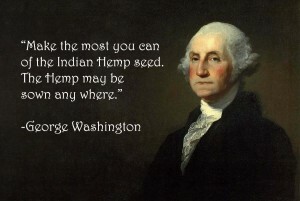 In 1797 Washington visited a hemp mill in Philadelphia owned by James Davenport. The story of the historical hemp industry in Pennsylvania is deep and fascinating yet the future of hemp is even more exciting. Two hemp bills are currently making their way through the General Assembly. Senate Bill 50 was introduced by State Senators Judy Schwank and Mike Folmer. House Bill 967 was introduced by Representatives Russ Diamond and Marty Flynn. Both bills passed in their respective Agricultural and Rural Affairs committees in October. He is right. The Keystone State has a unique strategic geographic position that gives us close proximity to all the major markets on the east coast. Hemp is currently doing well in Kentucky and Colorado. History tells us that hemp thrives in Pennsylvania like nowhere else. 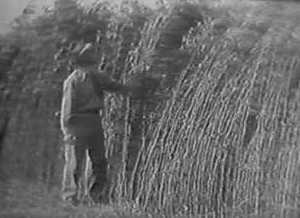 In the early 1900’s hemp grown in Adams County was declared better than the best Kentucky hemp. We have the potential to build a billion dollar industry right here in Pennsylvania utilizing industrial hemp. It will be an industry that creates jobs and helps farming to remain economically viable. Pennsylvania-grown hemp will be used in the manufacture of interior car parts, pressed fiberboard, paper, oil, biodiesel, textiles, food products, animal bedding, livestock feed, fuel pellets, and hundreds of other products – products that are already being produced in this country using hemp imported from China, Canada and other countries. Up to a dozen states are gearing up to grow hemp in 2016 including New York, where a projected ten research plots will be grown. A bill to allow hemp is currently making its way through the legislature in New Jersey. Delaware farmers may also grow hemp as part of a research project and some farmers are planning to grow hemp next spring in West Virginia. If Pennsylvania does not act quickly our farmers will be eating the dust of Kentucky. We can’t allow New York and our neighboring states to get a head start on us. The time has come for decisive action. The cultivation of hemp has been authorized in states that have passed pro-hemp legislation by Section 7606 in the federal farm bill of 2014. Senate Bill 50 or House Bill 967 will simply align state law with current federal guidelines. It is a simple adjustment for the Commonwealth to make but one that could open the door to a new billion dollar industry. The time is now to pass important and much needed hemp legislation for agriculture, labor and industry. If we do so immediately we can get seeds in the ground by spring of 2016. Help us get it passed! ~Les Stark is a board member of PAHIC, a Pennsylvania hemp historian and author of Hempstone Heritage. Visitors to PA Farm Show come to Know Hemp! Within the excitement of the 100th Anniversary of the Pennsylvania Farm Show is the added excitement that Pennsylvania farmers will be able to join their fellow farmers in 18 states across the nation who are starting to grow Industrial Hemp. 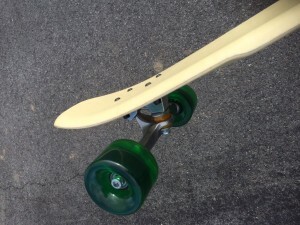 Visitors to the Pennsylvania Hemp Industry Council’s inaugural display are surprised to see its many uses, including 2 high tech, lightweight 100% sustainable skate boards produced entirely from Hemp fiber and resin. These one of a kind items were produced to demonstrate that anything made of composites today – automobile and airline components and, most sports equipment – can be made from this crop. They are also surprised to see that a wide variety of items and products, all containing hemp, are already being produced by Pennsylvanians and are already on the shelves in the Commonwealth. 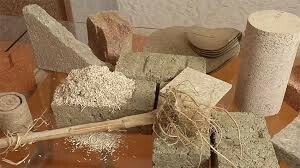 Today, Industrial Hemp fiber is being used to build composite auto parts, flooring, cabinets, fashionable textiles and biofuels. 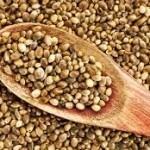 Hemp seeds, which are 100% digestible protein and having as much Omega 3,6, and 9 as fish oil, are being used for consumer products and animal feed. 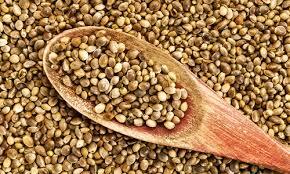 Hemp oils are used for cosmetics, lotions, dietary supplements, fuel and salad dressings. Hemp Hurd (the inner core of the crop) is used for building material, animal bedding and landscape mulch. There are literally thousands of uses for hemp and it’s a rare crop in that all parts of the plant are useful. PAHIC will be located in the main hall, booth 5160. Make sure to stop by and get to KNOW HEMP! With the passage of Legislation in Harrisburg and DC on the horizon, a group of advocates have created an educational council to promote the opportunities that will come to farmers, manufacturers and retailers with the reintroduction of the Industrial Hemp crop. The Pennsylvania Hemp Industry Council (PAHIC) was formally launched today to help inform and encourage investment in what is expected to be a billion dollar industry for Pennsylvania. 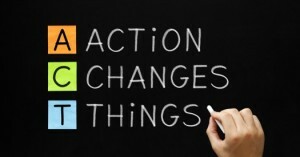 The non-profit organization will build a vital and effective collaboration of agencies, individuals and the general public. The 2014 Federal Farm Bill allowed States to reintroduce the crop in pilot programs. 18 States have done so, Kentucky being the most aggressive. Founding Members of the Pennsylvania Hemp Industry Council are activist and educator Erica McBride, PA Hemp Historian and Author Les Stark, Hemp Heals Foundation Founder and former Philadelphia Flyer Riley Cote, Pennsylvania Hemp Company President Adam Thompson and, AgriNext CEO Geoff Whaling. 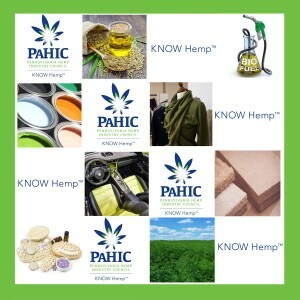 The Board unveiled a new website today, www.PAHIC.org, and will spend the next months promoting the tag line “Know Hemp” through farm events, appearances, social and mainstream media, to educate farmers, processors and consumers on the benefits this crop will bring to Pennsylvania when in full production. 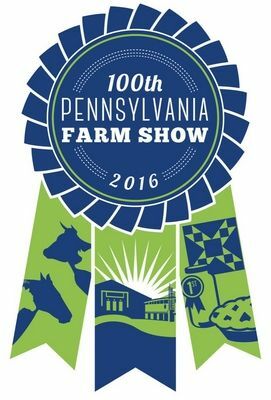 PAHIC is also proud to announce their participation in the historic 100th PA Farm Show which runs January 9th through January 16th. 100 years ago industrial hemp was still in production here in Pennsylvania. In fact in 1916 the US Dept. of Agriculture released ‘Bulletin 404’ favoring hemp hurd for paper production over wood. We look forward to presenting the modern day possibilities for sustainability and economic growth that hemp offers the Commonwealth. There will be expected appearances by the sponsors of hemp legislation in both the Senate and House, including State Senator Judy Schwank, State Senator Mike Folmer and State Representative Russ Diamond.